Well, yesterday’s guest post got a few interesting comments. They mansplained everything to me quite nicely. I would have responded, but it didn’t seem like debate was indicated. Many westerners apparently do know what’s good for the world, no matter what the world’s people think of it. Of course European armies going out to “fix” the world is at least a two millennium list of ghastly failures; but that’s the beauty of colonialism, if it fails, why, it’s because they are ignorant savages. Of course colonialism, especially the modern version, hasn’t failed to make a tiny number of people richer than all the tyrants in history, but of course colonialism is about helping people, not loot. It’s just a coincidence. Snort. In any event I am going to keep re-blogging stuff one won’t see in the Washington Post. I am assuming anyone reading this blog is curious about what other people around the world think. If not, well, plenty of lighthearted posts like this one to read. So, back to North Korea. I’m still hoping this is just a war scare, but still, really? Really? If it turns into a shooting war, I have no clue how it will turn out. I am still constantly amazed though by the people who believe that the USA would “win” in days. We bombed them flat in the 1950s war and they didn’t surrender, why would a few days bombing suddenly change their minds? Especially since they’ve had decades to prepare for more bombing? Hope springs eternal I guess. In the movies if you beat up the bad guys enough they always surrender, real life is a bit trickier. Movies are so much more fun too, as the above image illustrates. 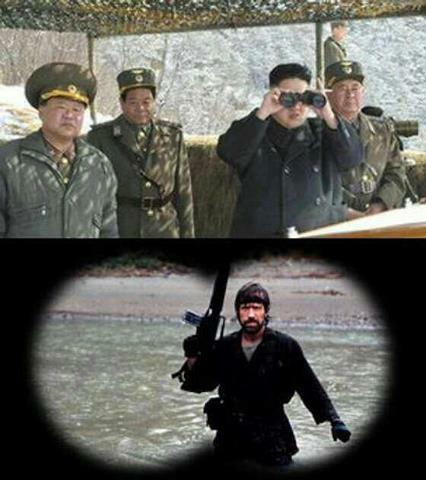 As long as North Korea doesn’t have any Chuck Norris’s of their own. Yes, that’s a biplane. And Antonov An-2 to be precise. An a amazing plane really, in production from 1947 until 2002. It was a light utility/transport aircraft and an all around useful aircraft. Crop dusters, fire fighting, whatever. Russian parachutists would practise jumps out of them into snowdrifts without parachutes! Russian are crazy. Wait, how was that even possible? It’s possible because the An-2 could fly as slow as thirty miles an hour. So in a thirty mile an hour headwind, the An-2 could fly in one place, in a stronger wind … it could fly backwards. 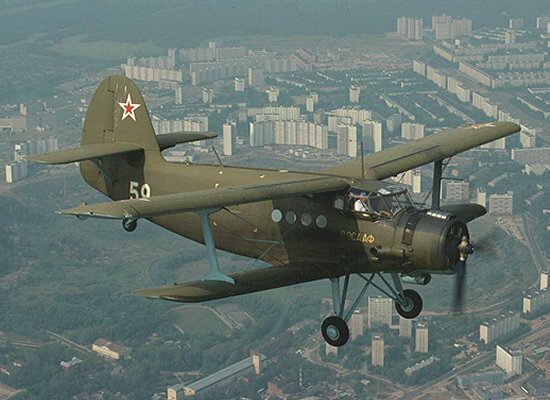 It was easy to fly, cheap to produce, and just in general one of the good things that came out of communist Russia. Over 18,000 were built, thousands of which are still in use. Including several hundred in North Korea. How is that a problem? Several things. Their version has canvas covered wings. This really lowers it’s radar profile. And the fact that it can fly at slow speeds at treetop level, it is very difficult to spot with radar or even visually from above. And it can take off or land on small dirt runways, so it isn’t going to be sitting at air bases waiting to be picked off by the USAF, they are likely squirrelled away all over North Korea. They have a range of over 400 miles, so they can reach all of South Korea and a large portion of Japan. The North Korean’s plan to load them with ten man suicide commando teams, and use them to attack American and Korean installations in the region. Yeah, it’s not a war winning weapon, but it could do terrible things. And there’s no way to really defend against it, any installation could be attacked at any time from any direction. Or a couple of these could sail in and land on a runway or a street inside a military complex like the Israeli’s at Entebbe. And North Korean commandos are good, some of the toughest and best trained in the world. They also have midget submarines. Same problem, more range. I really don’t want North Korean commandos popping up while I am shopping on Telegraph or wandering through People’s Park. I like the variety we get in Berkeley, there’s a limit. Next post, spontaneous human combustion and Bigfoot, new source of forest fires explained? Next post, spontaneous human combustion and Bigfoot, new source of forest fires explained? Are we talking spontaneous Bigfoot combustion? A good candidate for starting forest fires! Colonialism failed because it stopped before completing the mission. Self-determination for africans is like leaving a child on a highway because it is time for him to make experiences. Look at what happened with Haiti and confront the horrible fate of haitians with the ordedered development of other caribean french colonies. Also, who cares what thirlworlder think it is good for them. They have not enough brains to decide what the good is. But again, let’s leave children on the highway. Given that I was one of the two commenters on your post yesterday I think I can assume the first paragraph of this one is directed at least in part towards me, so I’d firstly like to apologise if my comment yesterday came off as hostile to debate or argument, that really wasn’t me intention. However given that the majority of my post was just pointing out mistakes, falsehoods and lies in the letter I’m struggling to see how that could be the case. I think you’re making a couple of mistakes yourself though. Firstly you seem to be equating disagreement with this letter as endorsement of cultural imperialism, and in today’s post you seem to equate endorsement of cultural imperialism with endorsement of violent colonialism. I may be reading that incorrectly though as I had to read your first paragraph a few times, and please tell me if I am, but those are some pretty big straw men, no? I’m not sure but I feel like I’m being called a racist here. Also the condescension (mansplain) is pretty annoying. Secondly, you also write as though this letter you re-blogged is representative of all Muslim women, calling it “what the people we are so concerned about helping actually think”. This letter is signed by a whopping eight women. Finally can you address the point I made (admittedly far too glibly) about apartheid? Would you consider that to be an example of the imperialism you seem to hate so much? I usually agree with you on this topic but when people are treated as appallingly as women are in many Arab states what exactly is your solution? Is it not a good thing overall that Femen draw attention to it? Finally, I should have thanked you in my post yesterday for re-blogging this at all, and for all the rest of your excellent posts. Thanks!